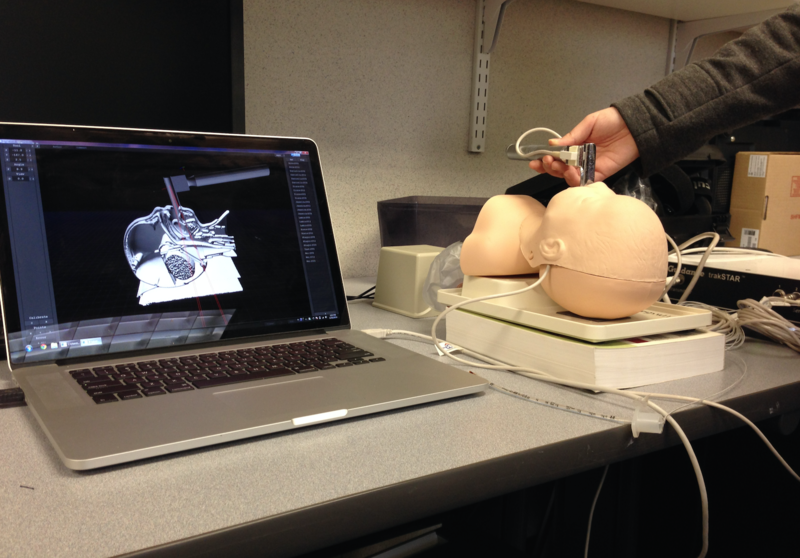 A team of GW researchers is developing a more realistic way to teach medical residents a lifesaving procedure for newborns. Physicians have less than 30 seconds to intervene when a newborn baby is having trouble breathing. They must quickly place a tube through a baby’s mouth and into the windpipe—a common procedure medical students aren’t adequately trained to do successfully during residency, some experts say. A team of cross disciplinary George Washington University researchers, in partnership with Children’s National Health System, were awarded a five-year $1,590,931 grant for their plan to develop a virtual reality training program that will improve pediatric medical resident training and better simulate a real-world medical emergency. James Hahn, a computer science professor in the School of Engineering and Applied Science, said better training is critical to saving lives. Neonatal endotracheal intubation success rates are low under existing training programs. After three years of training, residents still have only a 25 percent chance of positioning the endotracheal breathing tube correctly when confronted with a sick baby, Dr. Hahn said. Medical residents typically train how to do this procedure on an infant mannequin to simulate a human baby. These stiff and unrealistic training systems do not accurately simulate the real world and don’t adequately help students improve their skills, Dr. Hahn said. Without saliva, proper tissue interaction, and movement, mannequins don’t feel like a real baby, and the quiet of a classroom environment doesn’t mimic the pressures of a hospital. Preliminary studies have shown expert physicians do not perform significantly better on the mannequins compared to trainees. If training practices were more similar to doing intubation on a real baby, they would see a greater difference in the performance of experts versus novices, Dr. Hahn believes. This indicates current training practices do not measure likelihood of real-world success. In preliminary work for this project, the team created an augmented reality simulator based on CT scans of an infant mannequin which are then registered to the real mannequin using electromagnetic motion tracking. Students performed the procedure and could watch their movements tracked on a computer screen in real time using a novel visualization algorithm developed by the team. This system allowed them to visualize the internal anatomy during the procedure for the first time and gave students a new way to see how they could improve their technique. The system was used to record the 3D motions of the procedure for a number of expert and novice subjects. A machine learning algorithm was developed to automatically analyze and assess the performance of the subjects. Dr. Hahn and his team plan to extend the augmented reality simulation to a full virtual reality system that does not require the mannequin. Students would use a haptic device to navigate the on-screen procedure, which would provide resistance pressure when the devive used to insert the tube presses against the tongue and other anatomy. “We could make this as realistic as we want to. Instead of scanning the mannequin, we would use MR scans of real babies to create virtual models. We could then simulate the physics of deformation of the tissue in the virtual model during the procedure,” Dr. Hahn said. The virtual model would also allow more flexibility in training. Instructors could change the anatomy of the virtual baby by using MR scans of different real babies. This would better help students adapt to the variation in anatomy inherent in real-world scenarios. Dr. Hahn is developing this system alongside Lamia Soghier, a neonatal physician at Children’s National Health System and an assistant professor of pediatrics at GW; John Philbeck, a GW psychology professor; and Naji Younes, an associate professor in the GW department of epidemiology and biostatistics in the Milken Institute School of Public Health. The cross disciplinary nature of the team is the real strength behind this project. “The critical challenge in a project of this nature is to understand the way researchers think in other domains,” Dr. Hahn said. For physicians who work with premature newborns with underdeveloped lungs, being able to successfully do an endotracheal intubation is essential. Babies born before 34 weeks and those with complications in delivery may need the tube to breath in the delivery room when alternative methods are not readily available, Dr. Soghier said. Simulators are becoming a more common training tool in the medical field and other professions, Dr. Hahn said. Virtual reality could help residents learn how to perform neonatal endotracheal intubations the same way pilots use simulators to learn how to fly. The team plans to incorporate distractions in the simulator to mimic the stressful environment residents will need to perform the procedure. This will better prepare residents for a high-stress emergency. The virtual reality system, the machine learning automated assessment algorithm, and visualization algorithm will be assessed for training effectiveness by testing groups of pediatric residents across three years. The team will quantify the effect of technology-enhanced methods relative to the current training regimen in terms of both intubation performances on simulators as well as clinical outcomes in patients. The five-year grant titled “Neonatal Endotracheal Intubation: Enhancing Training Through Computer Simulation and Automated Evaluation” is sponsored by the National Institutes of Health’s Eunice Kennedy Shriver National Institute of Child Health and Human Development. This innovative research has been supported by the Office of the Vice President for Research, which awarded Dr. Hahn and Dr. Philbeck more than $86,000 over two years as part of the Cross Disciplinary Research Fund in 2016. This support made it possible to perform preliminary work that was crucial in developing the successful proposal, Dr. Hahn said. Increasingly, successful projects require the participation of experts from multiple disciplines, said Leo Chalupa, vice president for Research. “The Cross-Disciplinary Research Fund provides seed funding to help these teams form, develop their projects and generate preliminary data,” Dr. Chalupa said. “The ultimate goal is to improve the odds of securing external funding for the project. The funding of this proposal by NIH demonstrates both the quality of the team's initial work and the impact of early institutional support." Virtual reality is the future of medical training, Dr. Hahn said. Specializations like neurosurgery focus heavily on virtual reality, and he expects this trend to increase as physicians rethink old training methods.